We offer nonnative and invasive plant management. This includes all Category I and Category II plants identified on the Florida Exotic Pest Plant Councils (FLEPPC) list of invasive species. Some of the most recognized invasive species found in Florida wetlands include Australian Pine and Brazilian Pepper Trees. A complete list of the invasive plants can be found in the documents section. Australian pine trees were introduced to Florida from Australia during the 1980's. Australian pine invasions often displace native plant communities that provide critical wildlife habitat for threatened and endangered plant and animal life. Through many beach goers enjoy the dense canopy and soft pine needle floors, the pine trees encourage beach erosion by displacing deep-vegetation. Australian pine forests provide little to no native wildlife habitat and are highly recommended for removal. Brazilian Peppers are large, multi-trunked shrubs or trees that have become the most widespread of Florida's non-native invasive plant species. Brazilian peppers produce dense closed canopy forests that shade out almost all the other plant life. The leaves are evergreen, glossy green, and alternate. Although they vary in shape, the leaves are generally found elliptic to oblong and one to two inches long. Brazilian peppers are related to poison wood, poison oak, and poison ivy. The shrub-like tree also produces dense clusters of small berries that change from green to red as they ripen. The premier mangrove tree trimming company in Florida's Gulf Coast. 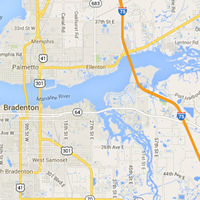 Servicing Bradenton, Sarasota, Tampa Bay, St. Petersburg, Fort Myers, Punta Gorda, Port Charlotte, Miami and Key West.